First we saw a massive bezel-less screen, allegedly of the vivo X30, later a live image of the eventual vivo Xplay 7 popped up on Weibo without a notch. Now a new photo appeared comes to lend some credibility to the impossibly high screen-to-body ratio (perhaps even record-breaking) of the Xplay 7. The phone pictured appears to be the same as the one in the live image from Monday - vivo’s Funhouse user interface, and slightly thicker bottom bezel that might host the selfie camera, similar to what Xiaomi did with the Mi Mix back in 2016. 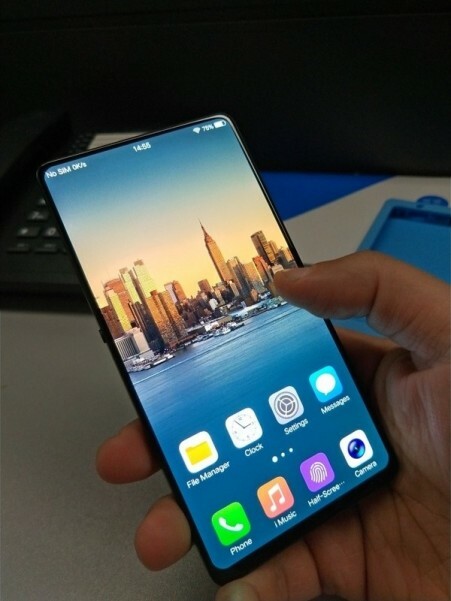 We have already seen vivo implementing a fingerprint scanner under the screen, so it is a safe bet to say this phone will have the technology as well, meaning the display with rounded corners is most likely an OLED panel. Leaked slides from last month suggest vivo is aiming to launch a phone with 4K screen resolution, Snapdragon 845 and 256/512 GB storage.